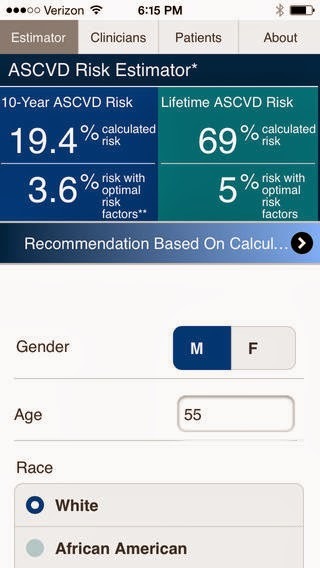 The ASCVD Risk Estimator app is published jointly by the American College of Cardiology (ACC) and the American Heart Association (AHA) to help health care providers and patients estimate 10-year and lifetime risks for atherosclerotic cardiovascular disease (ASCVD) using the Pooled Cohort Equations and lifetime risk prediction tools. This app is intended as a companion tool to the 2013 ACC/AHA Guideline on the Assessment of Cardiovascular Risk and the 2013 ACC/AHA Guideline on the Treatment of Blood Cholesterol to Reduce Atherosclerotic Cardiovascular Risk in Adults. The ASCVD Risk Estimator provides easy access to recommendations specific to calculated risk estimates. Additionally, the app includes readily accessible guideline reference information for both providers and patients related to therapy, monitoring, and lifestyle.